Tom Glover reviews the National Theatre’s touring production of Macbeth at Wolverhampton Grand. The uncertain Trainspotting-chic of the clothes and set displace the play from specific time and place, placing all focus on the strength of the spoken word. Three massive poles spring from the set floor, an arching wooden bridge dominates the stage and contains within it the key to this production’s magic. The bridge is regularly swung one way or the other, creating within the set a new intimacy and closeness, the environment changes with a simple push of the wooden construction. Bodies are dragged into it, characters emerge from underneath it, battles are won and lost on the sloping surface, it is the focus of what unfolds in front of you. The modern black fabric of the background clashes against the traditional red and gold of the Grand, it is as otherworldly as it is interesting, a refreshing experience that reinvigorates a potentially stale environment. The new-age, bass-heavy music creates a bizarrely modern atmosphere, emphasised by the party sequence just before Duncan’s death, complete with a traffic cone and a generator boombox. Amongst this hubbub the supporting actors will often freeze, with a spotlight thrust on Macbeth for him to deliver a soliloquy outlining his wavering ambition and uncertain action. Duncan looks at home in his regal robes, whilst Macbeth seems to impersonate an older Chico, his status as an imposter is seen through this dress as king, unable to settle into a role that doesn’t belong to him. Kirsty Besterman’s Lady Macbeth wasn’t quite powerful enough as what should be the powerhouse of the Scottish Play, slightly unbelievable as the character who is pushing the narrative forward and her husband into their untimely fates. This filters through into the relationship between herself and Michael Nardone’s Macbeth, where the closest moments between them felt like a forced intimacy, but nevertheless remained entertaining viewing. However, her death was done brilliantly; the most poignant moment in the whole performance came when Macbeth delivered his ‘brief candle’ speech whilst holding his wife’s body in his arms, visibly distraught and increasingly wrecked with worry and guilt. When Lady Macbeth dies, Macbeth is finished, the play hurtles towards its conclusion, quite literally watched over by the three witches. The three poles act brilliantly as vehicles for the witches’ control, their voices echo around the theatre from the top of the bridge and the top of the poles, assuring their ethereal authority with every refrain. They climb like monkeys, their plastic garments shimmer amongst the plastic curtains that envelop the stage, the weird sisters dominate the action that unfolds. 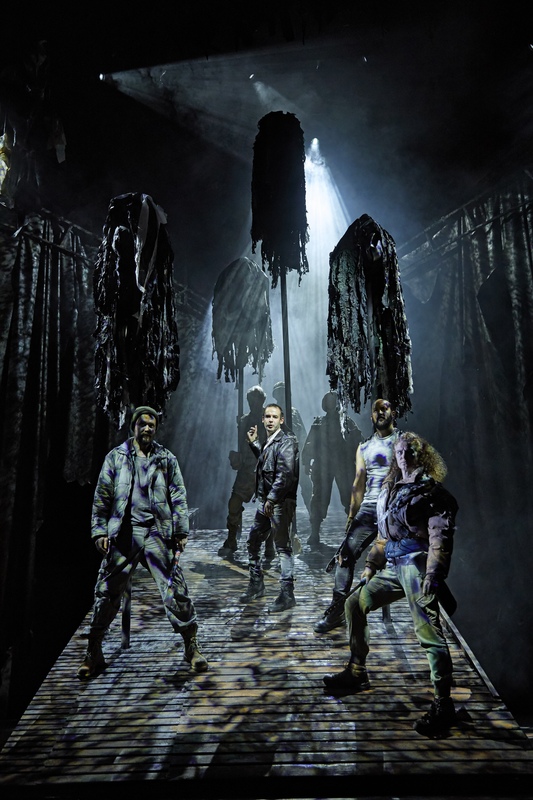 Macbeth at the Wolverhampton Grand is a beautifully crafted spectacle, carried by ingenious staging and passionate performances, and a fabulous production from the National Theatre. Tom Glover is a third year student at the University of Birmingham writing for a number of publications on art and culture.